I was so excited to see a book coming out combating Islamophobia and showing the damage these horrible stereotypes cause. Unfortunately, Love, Hate & Other Filters wasn’t as amazing as I had hoped it would be. Review In A Nutshell: The initial premise of Love, Hate & Other Filters is so good, and the scenes that revolve around Islamophobia and racism were compelling and left an impression. However, the other aspects of this book lacked any impact and took away from my overall opinion of it. 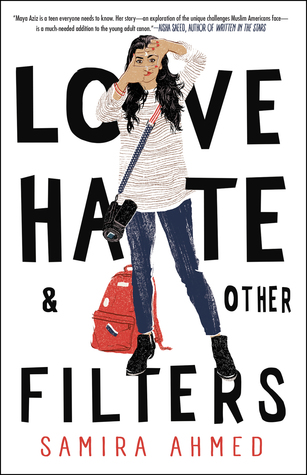 Love, Hate & Other Filters follows Maya Aziz, an Indian Muslim girl growing up in Springfield, Illinois. The one thing I adored in this book was seeing the two different cultures collide in Maya. There is her very traditional family who is pushing her into prelaw, telling her to go to a school nearby, and saying she must marry a suitable Muslim boy. Meanwhile, what she really wants to do is go to film school in NY, and maybe start dating the football captain that she’s had a crush on for years. Those dreams are thrown out the window, however, when a terrorist attacks her town and she is left to deal with the racism and prejudice thrown her way. While the initial premise of the plot sounds interesting and has the potential to be extremely meaningful today, I feel like it got pushed aside in favor of a weak romance plotline. The first half of the book is just Maya trying to decide which boy to like and leaning in favor of the guy who is already in a relationship. That didn’t sit too well with me. I honestly wasn’t a fan of either romance options for her, both of them just felt too forced and rushed. A lot of the plot points also felt like they lacked development and reason. The main character made one really dramatic (and pretty stupid) decision towards the end that I really couldn’t believe she would do. It made no sense for her character. I think my major issue with this book was with the characters. A lot of their actions and decisions seemed random as if they were made only to serve the plot and add some filler. Maya’s family felt the most realistic out of any character. They weren’t defined by their character traits and stereotypes, but they also seemed true to themselves, everything they did felt believable. While Maya herself did have some good qualities, she seemed one dimensional, with very little growth. And that goes with all of the characters. There all lacked development and growth over the course of the book. Maya maybe grew a little, standing up to her parents and focusing on her goals, but when that scene did happen I feel like she was too different. There was nothing really leading up to that scene that made me believe she would act like that. The love interest(s) also felt pretty weak to me, and overall pretty bland as characters. Usually, I would then look to the antagonist to add flair, but even Billy, the main antagonist for Maya, had little personality besides that he was a racist misogynist. They said it was the terrorist attack and including some things in his backstory to make it seem reasonable that he would crack like he did, but it still felt forced to me. The one character I thought was extremely well developed and was interesting to read about was the terrorist. He was twisted and clearly broken beyond repair, and I wish more of the book focused on him and the aftermath of his actions because that was what redeemed this book for me. This book talks about a really important subject matter. The way it deals with Islamophobia was a very true and honest depiction of this country. Ignoring the side plots and relationship drama, the message of this book is crucial for people today to understand. Especially if you, like me, don’t face racism and Islamophobia on a daily basis. Because so many people do have to deal with it, and their struggles deserve to be heard and understood, and hopefully if more people try to fight it, this world will be a little safer for people like Maya and her family. Pros– This book shows how Islamophobia truly effects millions of people every day, and its message is something more people need to here. This book shows a reflection of the most horrible parts of America today and encourages readers to do what they can to make a difference in our society. Cons– The characters, side plots, and relationships lacked development. While the writing style and general plot showed promise, Love, Hate & Other Filters lacked in the areas necessary to truly make it a memorable book.